See this gingerbread house? The one with turrets and bay windows, candy canes on the door, licorice piping on the windows and shingles lined with gumdrops and M&Ms. That's how a normal gingerbread house looks. Some people, however, like their holiday food tinged with grim reality, which is to say tragedy (and humor). A CBGB gingerbread house? That's cool. A plethora of gingerbread mansions? Show us where to sign the lease. Strippers and graffiti? Not so much. 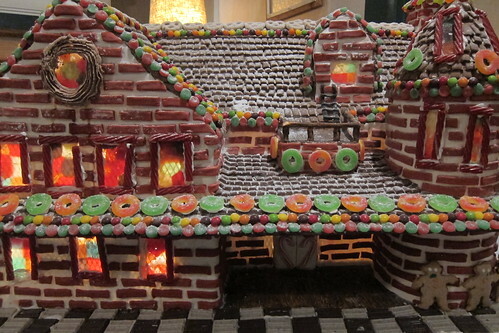 Hat tip to Happy Place for finding nine of the most offensive and insane gingerbread houses. Keywords: crack house, zombies, Haiti. P.S. We're not sure how a house made of bacon and another made of graham crackers qualifies as a gingerbread house, but we sympathize with blog writers desperately trying to meet a posts-per-day quota by inventing off-the-wall listicles (cough, cough), especially during the holiday season.